Isn't it shocking to think that the Legislators only needed to raise approx 1/10 the cost of the Rt.9 library (that's right ... 1/10) to save the Orphanage Property? 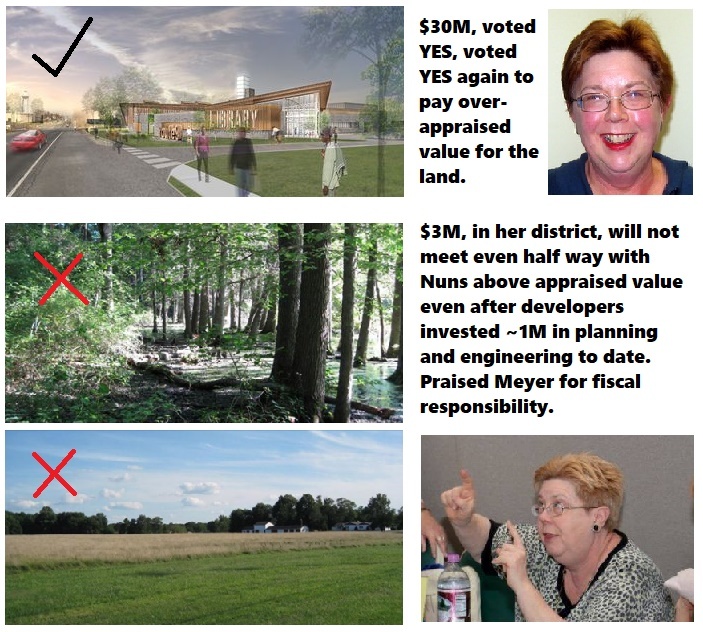 All three -- Councilwoman Diller, Rep Osienski, and Senator Townsend were first aware of the Nun's intentions to sell and build low income housing in 2013. They should have known the grave threat that presented to the entire open space, especially given certain ordinances. These include "workforce housing", compliments of Penrose Hollins, where this vast buildout (Chestnut Hill "Preserve") was actually a condition of the Nuns receiving a tax credit. Is that crazy or what? Instead of keeping this all a big secret, the legislators should have known that the most appropriate use of the land was for parkland, and immediately enlisted constituents and advocates to oppose it. A fight could have been led against NCC, demanding that they waive (they can do that) Hollins' ordinance. Instead, the legislators stayed mum, waiting until it was too late -- 2 years later in fact. Then Diller leaked it in 2015, leading to the bloodbath at Holy Family Church that July. If the property appraised at $5.9M, less than 3M would have been required from the State side for an even 50/50 match with NCC. Instead, Townsend and Osienski go around taking credit for achieving $1.25M in the bond bill, with only their promise of a second installment a year later. That gave Meyer all the excuse he needed to throw the Orphanage Property away, at one point even saying that Townsend lied having promised $6M in the bond bill. How much clearer can it be that they wanted the development to take place? That their developer friends and donors came first? 2013-14-15-16 -- the first three with Gordon -- and both Osienski and Townsend couldn't round up a $3M match for NCC funds. Yet they just love to blame NCC Exec Meyer (who arrived late in the game) for screwing the pooch. 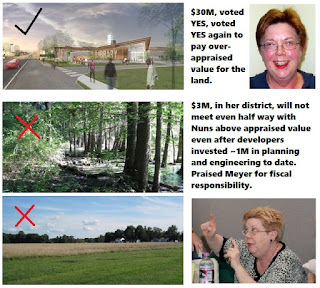 Had the alarm sounded in the 2013-14 time frame, Gordon would have jumped at the chance of State matching funds, and worked with the Nuns to rezone as necessary for the low income housing, and spin off the rest for a regional park. We know this because Gordon called us in the Summer of 2016 and we talked in person about it. He just needed to defeat Meyer in the primary and the rest would have been history we're sure. But that didn't happen; Meyer narrowly defeated Gordon. In no way does this excuse Meyer, because he could have made STOP happen in the 11th hour. Obviously, his campaign donors dictated otherwise. But it never should have come down to Meyer in the first place; Both State Legislators and Diller had a clear opportunity to wrap this up years before he arrived at the scene.